Of all the genres that Lego has not yet added to their product lines, steampunk remains the one for which I would hope above all others, even more than certain space themes. Since I was a child, steampunk has fascinated me, and, coupled with my love of Lego, steampunk-themed Lego creations were something I could spend hours browsing. The merging of technology and a certain grit/roughness/antiquity sparked the imagination and inspired building endeavors. The book begins with a section, entitled "What Is Steampunk?" While I am quite familiar with the genre, it is entirely possible that this book may be bought for a child or AFoL (Adult Fan of Lego), who has never before encountered steampunk or who wishes to know more about the genre. This quick forward/introduction sets the scene for plenty of unique and creative ideas in the forthcoming pages. Past the introduction, I find that the author has also set the stage for the book to be a bit of a fantasy narrative, the journal of a man exploring a steampunk world and describing what he finds with captions, quotes, and photographs. 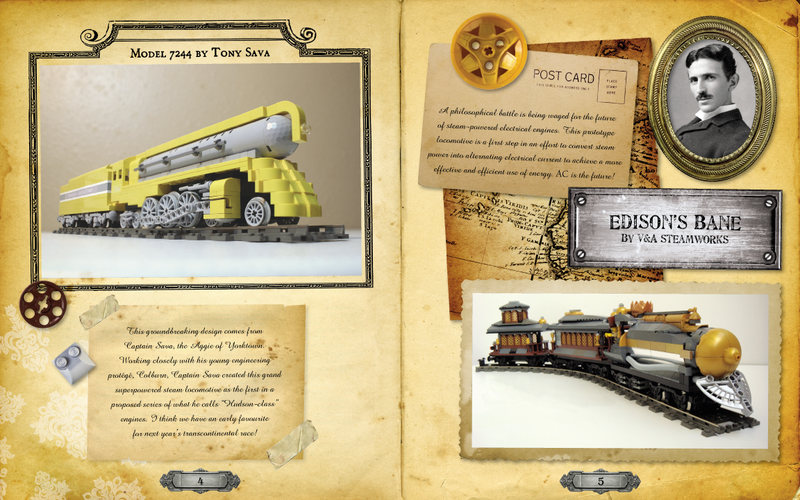 "Rolling Stock" takes the reader straight into the world of steampunk with a fantastic selection of train-centric designs. From single-man railcars to enormous rail-traveling monstrosities, they are all here. Civilian and military applications are covered, including an "Armada-Class Heavy Steam Railship" - a true battleship that rides the rails! Landships and battletanks also make an appearance, here with innovative designs, such as the "Light Steam Transport Vehicle," appearing for all the world like a steam-powered, military, covered wagon...with tank treads! Steampunk often touches on bicycles, motorcycles, monocycles, and other wheeled transports of the sort, affecting them with the power of steam and a great deal of inventiveness. "Monowheels and Penny-Farthings" highlights a number of these creations, even including a monowheel design meant for racing, all while taking a tongue-in-cheek approach to details such as obstruction of view and vehicle stability, terming them as mere "petty dangers." A favorite creation of mine from this section was the "W8," a small personal monowheel design that looks like a vehicle one might store in their garage and go riding on the weekends, like a steampunk dirtbike of sorts! Automobiles also have a place, here, in "Horseless Carriages." And yet "carriages" is taken loosely, including not only wheeled vehicles but multi-legged walkers, too. One of the most awesome models, featured here, involves a town built on rolling treads, which slowly move across the land, carrying shops, residents, and homes along on the journey. The sheer level of detail is mind-boggling. Of the more eclectic inventions, a crawling circus stage, powered by a large steam boiler, carries the local acting troop from one town to the next. No steampunk-themed book would be complete without mention of "Robots and Automatons," a vision of a steam-powered future in which these man-made (and often humanoid in appearance) beings serve as workers, soldiers, and transports. Yet this chapter does not stop with the automatons themselves, also including a design of "Robot Research Labs" and several exosuits meant for wearing by the user in combat or underwater exploration (underwater combat not yet tested)! The next chapter on "Armaments and Sundries" contains a curious mixture of life-size and smaller-than-life creations. From hats to weapons to musical instruments, even telephones, unique creations of the era of steam are featured here. Most impressive is the "Orrery," a mechanical model of the solar system, which appears to move upon a series of gears. The "Cabinet of Curiosities" reminds the reader of walking into an antique shop, filled with all manner of strange trinkets and baubles, the use of some of which can only barely be imagined. All of the creations and gadgets in this chapter are of a size that could fit in one's pocket, save for a design called the "walking ark," a mysterious cabinet, outfitted with arms and legs, which travels about, collecting these curiosities. For all their small size, some of them are quite creatively done, and this chapter was certainly one of my favorites. 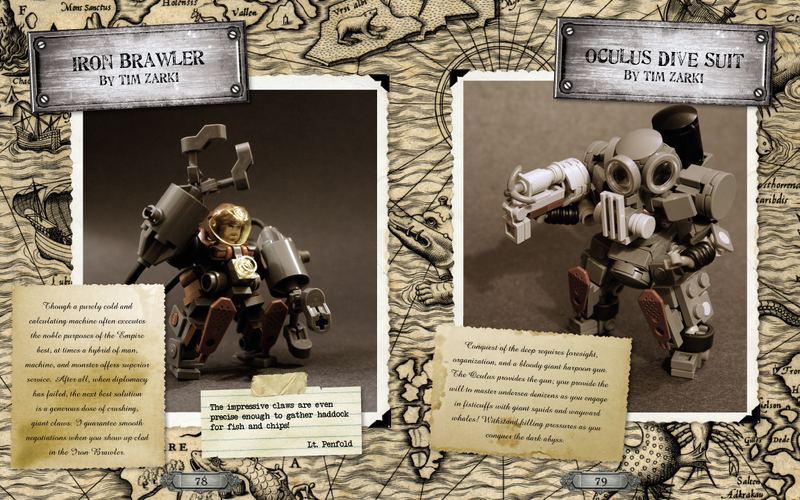 With the next chapter, Steampunk Lego shifts gears (no pun intended) to a different steam-powered theme: that of the high seas. Certainly, if railcars may be powered by steam, why not transports that sail the waterways of the world? And yet, contained within the chapter, entitled "Seven Seas," lies much more than just boats. Undersea craft, often designed to look like animals, themselves, are masterfully designed. With the power of steam, submersibles also feature highly in the collection of creations. Leaving the seas and taking to the skies, "Airships and Dirigibles" showcases all manner of fantastic, steam-power flying machines. While some of the machines here are small, one-man craft, others appear as massive, flying cities or flying war machines. The "Zeppelin" with its interior Lego frame is particularly impressive, as are the airships built for racing. 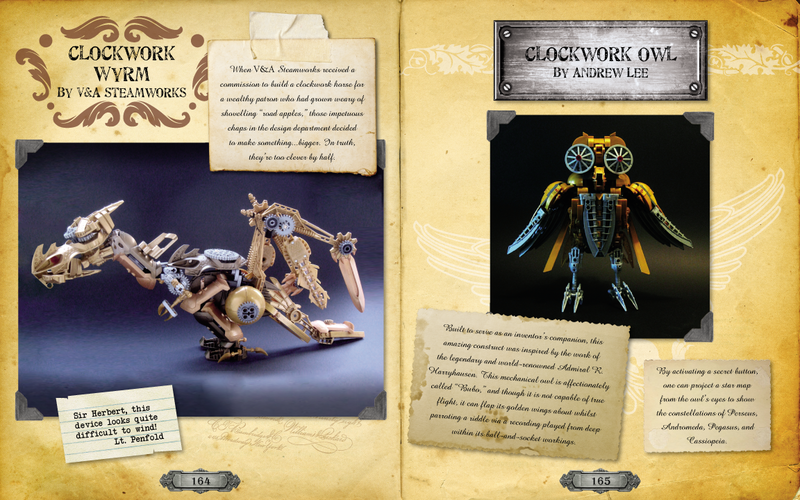 Animals have not escaped the touch of steampunk, as shown in the "Clockwork Beasties" chapter. Big and small, realistic and fantastic, there are designs for transport, for war, and even for sport. Most intriguing was the "Warclaw," an ostrich-looking beast, able to be ridden by soldiers into battle. This next chapter contains my favorite content of the entire book. The idea of "Floating Rocks" - gravity-defying islands in the sky - prompts an immensely high degree of creativity with each model being a unique masterpiece. In a variety of scales, from fortresses to humble abodes, powered by the weird magics and steam, calling them "floating rocks" sounds almost derogatory for such beautiful works. Truly, if for no other chapter, I recommend this book for this one. In the last chapter lies "SPACE!" These models are absolutely amazing. For the most part, they represent steampunk versions of classic ships from Star Wars, but Battlestar Galactica and other more generic starcraft make appearances. While whimsical, the conversion of these craft to steam has been masterfully done. Many thanks go to No Starch Press for providing me with the opportunity to review this book. I was thoroughly impressed with the organization and content therein. 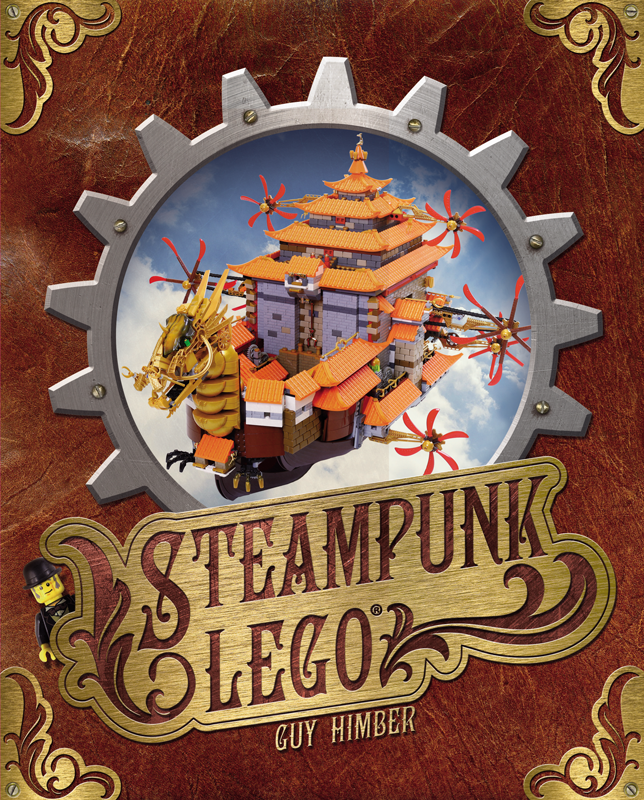 Truly, this book was a delight to peruse, and I highly recommend it for Lego-lovers with an interest in steampunk! Photos credit to No Starch Press and used with permission. 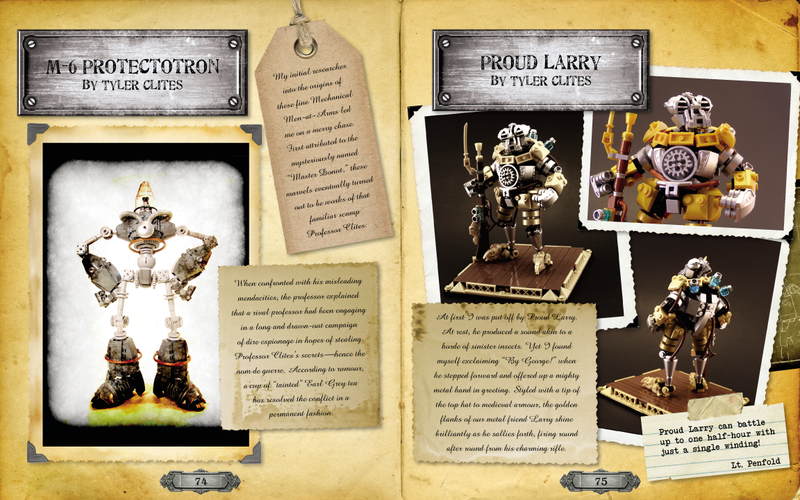 Steampunk Lego is available directly from No Starch Press, here, and on Amazon, here.